How has autonomy become a commonplace term in our conversations? It seems only a short time ago that autonomous vehicles seemed futuristic and a little far-fetched, doesn’t it? 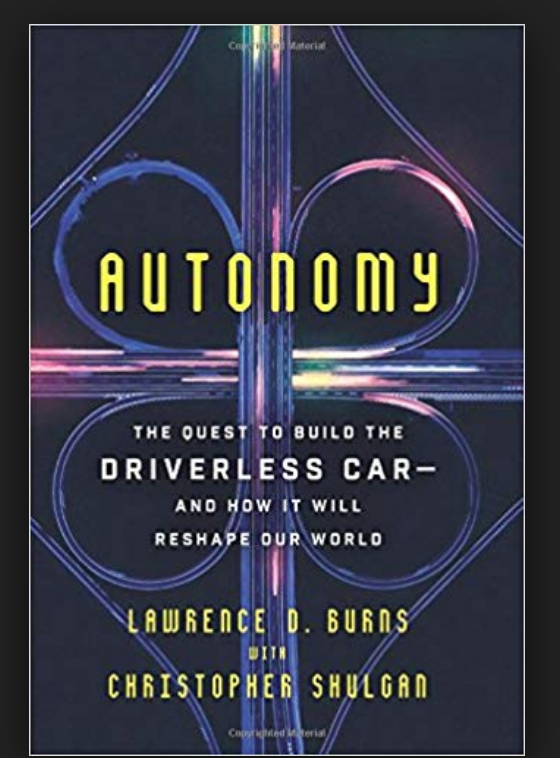 In Autonomy: The Quest to Build the Driverless Car… and How It Will Reshape Our World, Lawrence D. Burns describes a transportation future where we “safely and conveniently use autonomous vehicles to take us where we want to go” (p. 1). 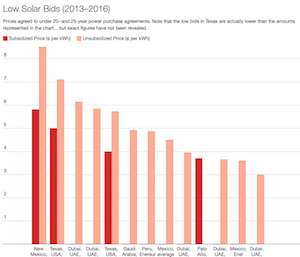 How have we come so close to this reality of on-demand transportation autonomy? 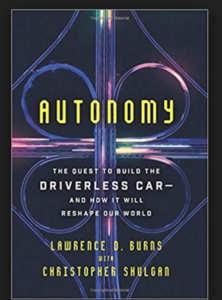 In Autonomy, Burns narrates how robotics teams have taken hundreds of thousands of steps to train self-driving cars to react to the same obstacles to which human drivers react. And the story of that technological roadtrip is fascinating — especially to those of us who have heard pieces of the autonomy story but didn’t understand the ramifications of the self-driving Big Picture. 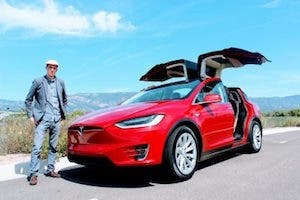 The book points to a future in which our trips will primarily take place in a 2-seater electric vehicle (EV) hailed through a car-sharing company. 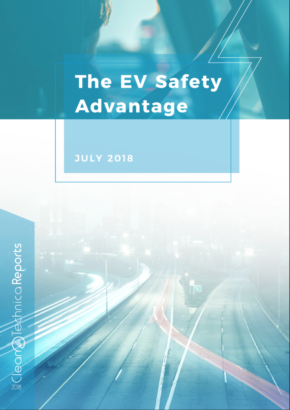 As users, we’ll pay a “monthly subscription fee in exchange for on-demand use of a company vehicle for a certain number of miles per month” (p. 228). Autonomy helps us to understand this likely future reality by taking us back to the beginning of robotic transportation research. The book, however, is not an encyclopedic compilation of dry sequential facts. Burns’ career spanned head of research and development at General Motors to consultant at Google. Likely not a confident writer himself, Burns was wise: he brought on a ghostwriter, Christopher Shulgan. As a result, the chapters unfold as stories with a mystery genre-like tone. For example, Chapter One is the story of the Defense Advanced Research Agency (DARPA) challenge to stage a race for robot cars across the Mojave Desert. The adventures of the robot named Sandstorm are unveiled in real time and with a sense of suspense, urgency, and wonder — will it win? 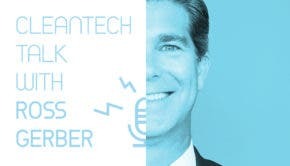 Had its team anticipated all technology glitches? Of course, having famous names like Google co-founders Larry Page and Sergey Brin sprinkled throughout the chapters doesn’t hurt, either. (“Larry’s always been a robotics enthusiast,” one of the team noted.) The authors blend dialogue from interviews; infuse historical contexts (i.e. the importance of drone imagery from Iraq and Afghan territories); trace a cast of unlikely, contradictory, and often combative tech team characters; and, unveil a play-by-play of robot races that reads like a whodunit. Instead of Sandstorm’s electrical motor and lever that pushed against the gas pedal, the new entry, HIghlander, has a throttle that was controlled electronically through a computer system. With less margin of error, HIghlander was becoming a better robot driver. Sure, robot cars encountered obstacles they didn’t understand, like rolling over on a test track when sandbanks resembled a computer scenario that called for acceleration into a curve. When the robot would encounter something it couldn’t handle during research phases, someone on the team would code a fix. “As the process repeated itself dozens, and eventually hundreds of times, the robot became sophisticated enough that it began to teach itself” (p.60). Robotics had been seen as “novelties, curiosities that had little effect on anyone’s day-to-day lives” (p. 64). Then the 3rd race, the 2006 DARPA Urban Challenge, sought robots that could “navigate the chaotic urban environments of Iraq or Afghanistan” (p. 68) — traversing 60 miles in 6 hours while obeying the rules of the California Driver Handbook. As part of that Challenge, Dave Hall became fascinated with LIDAR’s potential to create a 3-dimensional scan of the world so that the robot could detect oncoming vehicles in all directions. And Anthony Levandowski — later to become well-known in 2017 in a lawsuit between Waymo and Uber — was “selling LIDAR to as many teams as he could” (p. 73). Meanwhile, Thrun and Levandowski sold their VueTool technology to Google to accelerate the Street View project. While Street View was in development, Urmson and Slesky were constructing situations that would wreak havoc on their vehicles computer algorithms — “situations unlikely to happen in real life,” (p. 82) which resulted in a robot that “could drive in traffic at the speeds that were commonplace on public roads” (p. 83). Problems did stymie continual forward progress in autonomous vehicles. 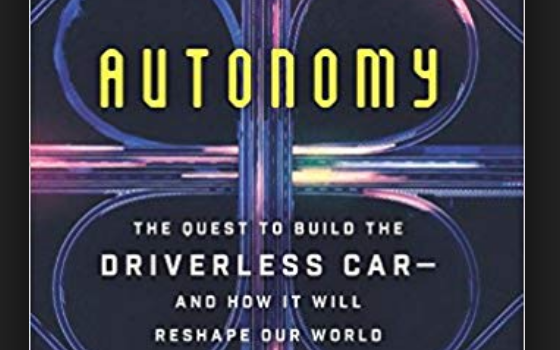 As GM tried to separate itself from its health care obligations and “with the specter of bankruptcy looming” (p. 160), company research into autonomy fell by the wayside. Ideas to design an autonomous vehicle based on the Segway idea seemed, well, silly to audiences. The idea that “self-driving cars were a near-term possibility” (p. 166) seemed too idealistic — that is, until Larry Page told Thrun that he “should work on self-driving cars” (p. 168). With the budgetary backing that Google could provide, Thrun hired a team of about 12 engineers to create an autonomous vehicle that could successfully navigate 10 drives totaling about 1000 miles. These routes would duplicate the driving experiences of most any California street. Optimism permeates Autonomy. When Google executives are invited to run the same route as Chauffeur but faster than the robot, not one exec succeeds. 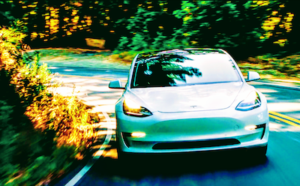 The authors exclaim that the team was “creating a vehicle that could drive not only as well as a human being — but better than one. Faster, sure. But more importantly, more safely, with less of a tendency to get distracted or confused” (p. 182). 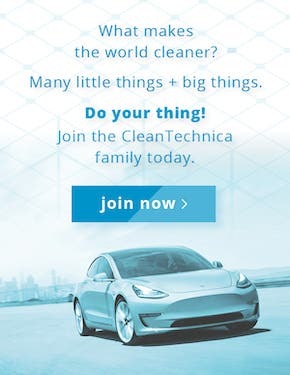 Undeterred, the team continued on, feeling “like we were working on something that would change the world, that would have a positive effect on many of society’s most pressing problems, from pollution to the most basic challenge of just getting around our planet” (p. 201). The book ends with the acknowledgement that the mobility disruption will affect different people differently. The elderly will experience liberated mobility, while some current autoworkers many lose their jobs as a result of autonomous technologies. “If we can pull it off,” the authors conclude, “and we will, we’re going to take 1.3 million fatalities a year and cut them by 90%. We’re going to erase the challenges of parking in cities. All of that land will allow us to reshape downtowns. People who haven’t been able to afford a car will be able to afford the sort of mobility only afforded to those with cars. 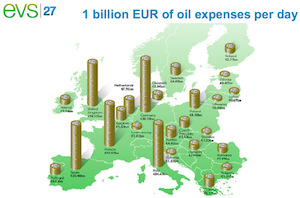 And we’re going to slow climate change” (p. 326).